Gumball is my go-to show to watch at the moment. It’s such exuberant, silly fun with such likeable central characters and such joy in the medium of animation. Not every episode is a hit but enough of them are that I’ll always have fun in any viewing session. The season starts in a slightly sad way as the original voice actors pass the torch to the new kids. Replacing kid actors is generally necessary in these kinds of shows, though they seem to be letting Jeremy Shada keep voicing Finn long-term since he replaced his brother in Adventure Time. In fairness, by the time the voice work for Gumball season 3 started, the boys’ voices had changed a lot, even when they weren’t exaggerating it, and it was nice to even give them a send-off rather than just making the switch behind the scenes. I’m not generally that keen on meta-humour dominating a whole episode, and the season finale where the cast contemplate selling out for money didn’t work for me, but in this case it was sweet and worked well as a pretty original concept. Otherwise, the season is mostly more of the same. The kids get into scrapes with various classmates and family members, struggle with allergies, try to watch scary movies without Anaïs, or think up an imaginary friend. The show does a great job of taking tried-and-tested concepts and subverting them, or sometimes affectionately pastiching them. The show also does the surprise anticlimactic ending even better than Adventure Time. But this season doesn’t just coast along doing the same old things. There’s a fair bit of character development. Some background characters get more fleshed out, with Sarah and Alan getting episodes centred on them, and one episode is even centred on ‘extras’. There’s also quite an interesting side-story where uninteresting background characters disappear into ‘The Void’, with one not only being rescued from there but another becoming a much more major player when he manages to escape. Most significant, though, is the development of Penny. 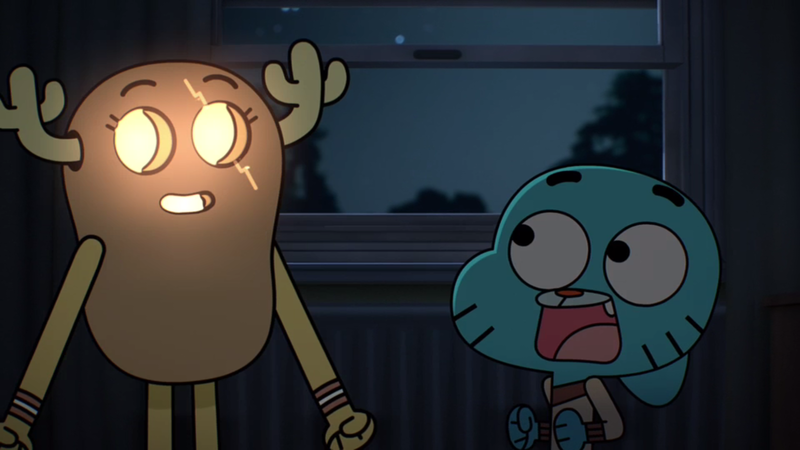 Initially Gumball’s comedy crush, the two of them have genuinely gotten closer, culminating in Penny literally coming out of her peanut shell. It’s a very interesting development and it’s sweet how the couple are still so awkward and it doesn’t end up taking over Gumball’s entire life. Perhaps more interesting is the effect it has on Darwin. He’s initially very jealous and protective of his best friend being taken away from him, and his protestations of love for Gumball get pretty ardent. It walks a nice middle ground where potentially gay kids could see him as a perfectly normal boy with a gay crush (albeit on his adoptive brother, which is a bit weird), yet it’s also completely possible to see his devotion as a ‘bromance’. Religious groups can’t go crazy about it corrupting youth but at the same time it leans towards the normalisation of if not homosexuality, then dismantling the limits of what can be portrayed on kids’ TV in terms of appropriate expression for boys. Which is not to claim Gumball is spearheading a cultural revolution. It’s just a nice background touch to a smart, entertaining and inventive TV cartoon. Which I will certainly continue to watch.